Traders Hotel Manila offers panoramic views of Manila Bay - conveniently located on Roxas Boulevard near the Cultural Center of the Philippines - the Philippine International Convention Center - the World Trade Center - and SMX Convention Center. A short walk away is the entertainment district Malate - with restaurants - casinos - and shopping. A short drive away is the SM Mall of Asia and the Makati Business District. Enjoy Asian and international cuisine at our newest full-service restaurant Latitude. A la carte menus include dishes from the same latitude countries such as South Africa - Mexico - and Thailand. Kikuji features authentic Japanese cuisine - sashimi - tempura - and other specialties in a full-service environment. The Lobby Lounge offers light snacks - a wide selection of wines and beverages - plus nightly entertainment. Coffee.com is our cyber cafe featuring high speed Internet access so you can meet - check email - or read the news online over coffee or a savory salad - sandwich - or pasta dish. The hotel caters to meetings - seminars - corporate events - exhibitions - and social gatherings. A/V equipment and multi-presentation facilities with wireless Internet are available. The Embassy Ballroom accommodates up to 500 guests - or divides into 2 separate sections. Other function rooms accommodate gatherings of any size. Recreational facilities include an outdoor swimming pool - fully equipped fitness center - and health spa. Traders Hotel Manila offers 303 well-appointed guestrooms and suites - with full-length windows looking out onto Manila Bay and Roxas Boulevard. 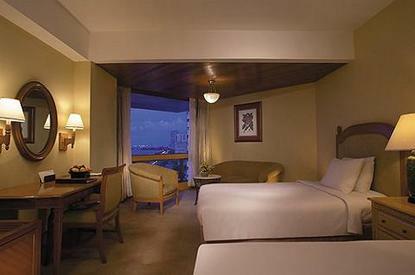 Each guestroom has quality amenities for a pleasant business or leisure travel experience. Suites offer a separate sitting and dining area. Exclusive Traders Club rooms feature complimentary amenities and services including - lounge facilities - buffet breakfast - afternoon tea - all day beverages - purser service - and office support.